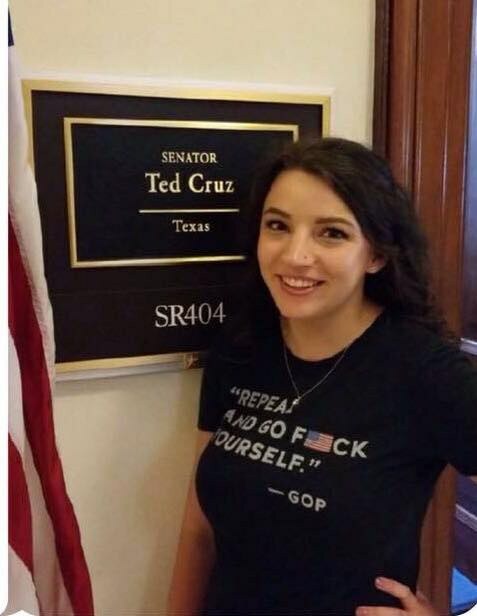 Ted Cruz and his staffers didn't even notice the "Repeal and go f*ck yourself" shirt. As a Democrat and leftist in a red state, I routinely call all of my representatives to voice my distaste for their platform and actions in congress. However, when I discovered that my Senators hold weekly coffee meetings with constituents whenever the Senate is in session, I thought that this would be a unique opportunity to voice my concerns directly to them. When I attended Senator Cruz's meeting this week, I decided to wear a Crooked Media shirt that says " 'Repeal and go f*ck yourself' - GOP" in protest of his amendment to the Senate wealthcare bill, which says just that to the people who need healthcare the most. Under Ted Cruz's amendment to the Republican Wealthcare bill, insurance providers would no longer be required to hold to the same consumer protections as under the ACA, meaning that some plans could reinstate lifetime and annual caps on coverage. This hit particularly close to home for me, as my 1 year old goddaughter was recently born to a family with a history of premature births. When her aunt was born premature, her hospital bill at birth was $500,000. Over the next 6 months, that would rise to exceed $1 million. Thankfully, my god daughter was born happy and healthy, but under Cruz's amendment, an infant in a similar situation as her aunt could have hit their annual cap before they even left the hospital. When I explained this to the senator, he decided to argue over the fact that cutting Medicaid takes healthcare away from the people who need it most. He claimed that the people cut from Medicaid would be able to simply buy one of these plans that offer less coverage, and less protection. I argued back that while that is true, the plans have dangerous caps and are not required to cover pre-existing conditions - like pregnancy is now considered. After about a 5 minute back and forth, we were interrupted by a staffer who encouraged me to get my picture so the line could move along. No one except a couple of giggling interns seemed to notice or mind the message on my shirt, and Senator Cruz definitely did not seem to care about the message I was telling him. While important, we can not rely on just calling and lobbying our senators and congresspeople to vote for their constituents' best interests. We have to repeal and replace them. We do this by supporting the momentum of Democratic candidates like Beto O'Rourke against Ted Cruz, and Will Fisher against my Republican Congressman Michael Burgess. We can not hold Trump accountable and protect ourselves from these draconian healthcare bills with the congress we have. So let's lace up our shoes and do some organizing. You can follow Nicole on Twitter @NicoleJWebb.